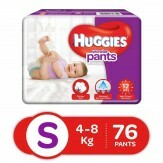 Amazon is Selling Huggies Wonder Pants Small Size Diapers (76 Count) Rs.597 Best and lowest price online.To avoid shipping make cart value 499 Else (Rs. 40 Shipping charge) .You can follow the below steps to buy this product at their deal price. How to buy Huggies Wonder Pants Small Size Diapers (76 Count)?